Cutting-edge government leaders are constantly seeking new and innovative ways to solve public problems. The challenge facing government managers is to find these new approaches. One new approach is the use of challenges, which use “crowdsourcing” to canvass solution approaches for particular problems. Challenges open up new avenues for connecting people who have innovative ideas to people in government who can implement these ideas. A recent IBM Center report, Managing Innovation Prizes in Government by Luciano Kay, examined various models pioneered in the private sector to connect innovators with ideas to businesses looking to solve problems. This report by Dr. Desouza provides an in-depth examination of a cross-government electronic platform, known as Challenge.gov, created to be a one-stop location where agencies can pose problems and challenge the public to provide solutions. 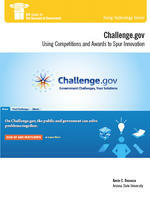 Federal agencies have posted nearly 200 contests on this website since it was launched in September 2010. Dr. Desouza examines the outcomes of various contests to better understand the issues and problems for which agencies are seeking solutions, and evaluate the various approaches they are using to conduct these contests. The concept of challenges gained a legislative boost in December 2010, when Congress included a prizes component in legislation, the America COMPETES Act, designed to increase American innovation and competition. To gain insights about what worked in Challenge.gov and what can be improved, Desouza interviewed government managers who sponsored contests, and contest winners. Based on his research and their insights, he offers a series of findings and recommendations on ways agencies can better use Challenge.gov, from the pre-competition phase through design, launch, and operation, to identify promising ideas for solving public problems. Based on his research, Desouza concludes, "Challenge.gov is still in the developmental stage and our analysis and interviews point to numerous opportunities to improve its operation and impact . . . We believe Challenge.gov is a viable platform for solving the grand challenges of our time." While Challenge.gov is designed to primarily address federal innovation needs, there are similar platforms being developed for local government use. We think the insights and recommendations presented here will be helpful to them and to federal managers who seek to tap into the innovative talent of the American public.